After a successful test run of labels for a client, I started trying to figure what to do for fun. 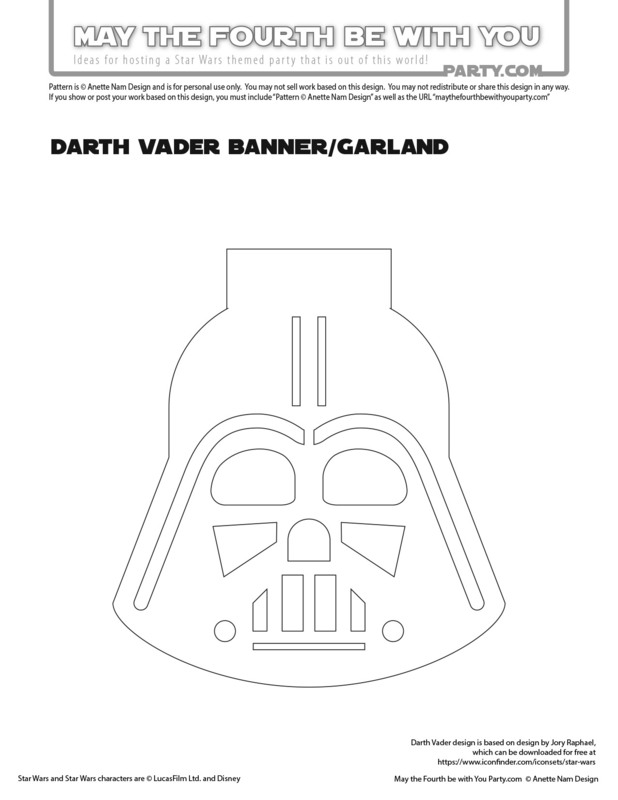 If you remember from our last garland/banner/flag post, M4P Mom had suggested that I make Star Wars banners, and what better project than that to try the machine out. 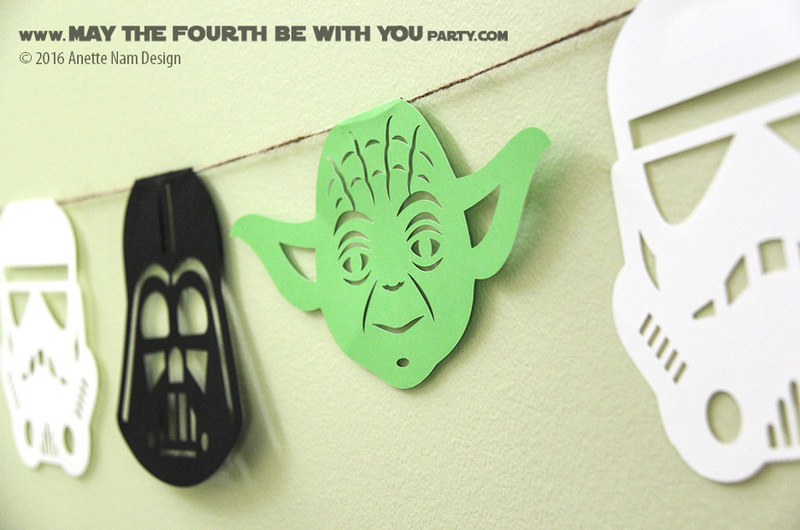 We made a bunch at the time, and this a our second post with downloadable patterns for y’all! For full disclosure, I do have a love-hate relationship with the Silhouette. I pushed it to its limits for our 2015 Star Wars Christmas cards, and I have to admit it is pretty finicky. But we will get to that in another post. Figure out which and how many designs you need. Fold the top of each. Measure the window/area the banner will hang. Cut the string a to size (add a bit extra, for good measure). Fold the string in half to get the middle. Starting there, going out to the edges, lay out the flags/designs. Starting with the middle one, carefully glue flap and press closed. 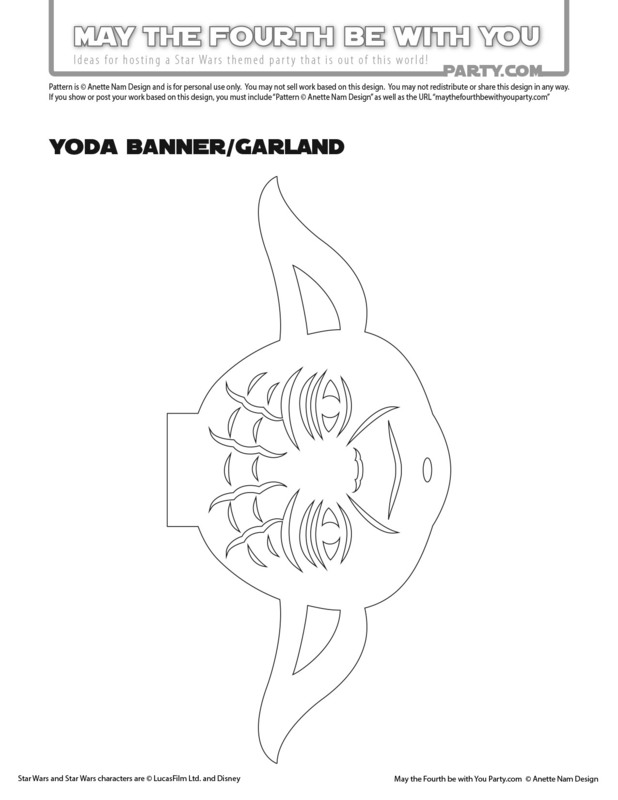 Click here to get the STAR WARS letter patterns in our previous post. If you are cutting by hand you can use either a jpeg or a pdf. If you are using a cutting machine you will need a vector file. Download the pdf, and convert to the format you need in Illustrator . And as always, feel free to use the patterns for any and all personal uses, but do not sell any items made with them. We love people sharing, but do not share them off your own site, instead, link to this post. 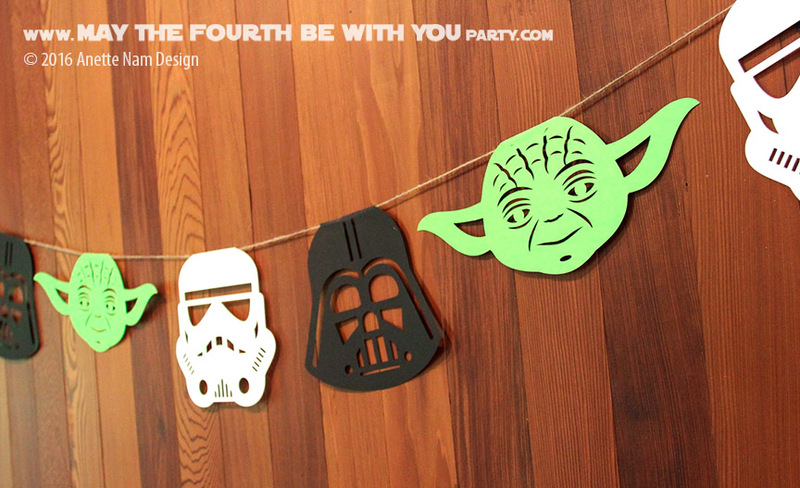 And if you post pictures (anywhere), you need to write “Pattern ® Anette Nam Design” and include the URL maythefourthbewithyouparty.com. The Stormtrooper and Darth Vader designs are based on designs by Jory Raphael, which can be downloaded for free for personal use at https://www.iconfinder.com/iconsets/star-wars. Check it out, there are some really nice vector images! Dont suppose u have any of these for sale….. id rather just buy pre made ones. I have a question about getting the silhouette to cut the images. I am only able to cut out the outline. Any advice? 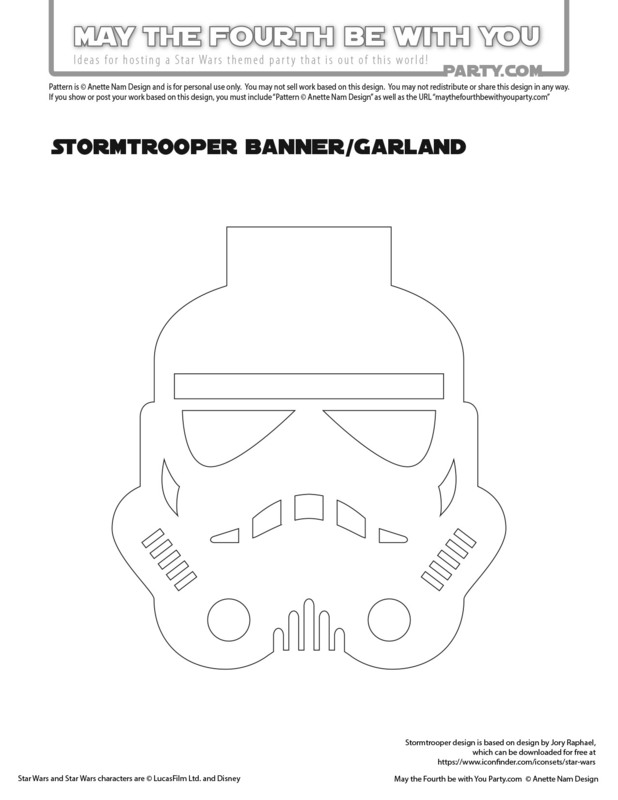 I am having trouble getting my silhouette to cut the details of the storm trooper. Do you have any advice? Hm… The Silhouette Cameo is just the most wonderful thing, until it just doesn’t work…. And that does happen a lot! I am assuming you are opening the pdfs into illustrator (or something similar) and then converting the files to dxf files, and then open those in the cutting software? Are all the lines there in the Silhouette Studio? If so, there should be no reason they wouldn’t cut. You can try their support line, 1-800-859-8243. From my experience, they are very helpful. There are also some good troubleshooting ideas on their website: http://www.silhouetteamerica.com/faq/topic/silhouette-troubleshooting Please keep me posted on your progress. Good luck! I should add that I have had that happen too, but it has always worked after 2 or 3 tries (and maybe a restart of the machine). I have to show this to my sister. My nephews love star wars. Thanks for sharing! I’m so glad you like them!! They were really fun to make! Make sure your sister looks at all the other fun Star Wars things we are doing on the site too.